Save Time and Money, Instant Online Quick Quote. Van hire Spain wide to move your home lock, stock and barrel from the UK to a location abroad may seem like an excellent choice if you�re proactive, on a budget or you just enjoy doing things for yourself. But there are many aspects regarding removals to Spain that you must take into account before you hit the road. From loading the van to going through customs, it�s a hugely stressful task that can often lead to disaster. In this short guide, we�ll look at the pros and cons of self-hire so you can decide whether van hire really is the right option for you. 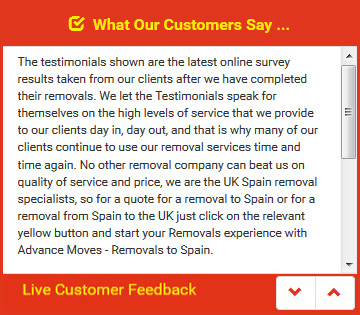 What Are The Pitfalls Of Do-It-Yourself Removals To Spain? One of the first factors to consider is the physical route you�ll take to your new home. Will you catch a ferry directly from the United Kingdom to Spain, or drive through France to avoid higher ferry fees? If you opt for the ferry, then you may have to factor in fees for a cabin and any excess payment you could be charged for running a commercial vehicle. Travelling the more scenic route via France may seem an attractive, money-saving option, but remember, this will add more days on to your total travel time. How much will additional fuel, overnight accommodation and other living expenses cost en route? Either option may require more time or more money than you budgeted for. Once you�ve decided on your route, you can investigate the expense of van hire or moving furniture to Spain for the duration of your trip. Usually, there�s a four-day minimum hire period, whether you need that long or not. You�ll then have to factor in vehicle insurance, which may be more than advertised if you add an additional driver, for example. Don�t forget to consider insurance for your load � your own personal possessions - which may not be covered by the standard goods-in-transit insurance. Factor in road toll fees, potential breakdown costs and fuel charges and you may well find that van hire Spain to move your own gear is potentially a costly endeavour. What�s more, reading up on the laws particular to each country you pass through can be confusing. Is van hire UK to Spain really the right option for you? So what factors relating to the legal side do you have to bear in mind? Your vehicle is quite likely to be weighed by the authorities in the UK, Spain and France, if you travel through there. On-the-spot fines are imposed if the weight of your load is not evenly distributed or is over the legal limit for the van. It doesn�t end there either. Border police, motorway police and other transportation officials may wish to check your vehicle for contraband or other illegal activities. Guardia Civil in Spain, for example, are constantly vigilant for illegally operated vehicles run by British companies that don�t pay registration fees or taxes. Therefore, you�ll need to carry the required vehicle and driving documents with you at all times. Unfortunately, fake police also patrol borders and motorways and clearly signed self-hire vehicles are a target for their illegal activity. They�ll present you with fake documents while their cohorts search and loot the back of your van. The truth is that the whole situation regarding van rental and self-hire can be utterly overwhelming and understandably deters many people from undertaking their own move. So what are the alternatives to one way van rental UK to Spain or one way van hire Spain to UK? One of the best bets is to employ a specialist, experienced firm like Advance Moves. A reliable, tried and tested team like this can do everything for you with less stress and at a price that�s considerably lower than self-hire. Advance Moves was established in 2002 and ever since, we�ve been helping people move their furniture and prized possessions from country to country. We understand how time-consuming, costly and frustrating it can be to transport items to another country yourself, so we take pride in making your relocation as painless as possible. Our vans carry out regular removals to Spain, easily beating the expense and hassle of van hire Spain wide. So if you�re moving from the United Kingdom to the sunny reaches of Spain, then why not request an online quote today? Simply visit our straightforward website at http://www.advancemoves.com/ to get an idea on price. We look forward to assisting you. By submitting your basic quick quote details we can automatically generate a quick quote for you that will be emailed to you immediately. This will give you a volume and price range from the basic details submitted and you will then receive (directly) a more accurate and detailed quotation from up to 6 of our agents/partners, depending on your removals location and requirements.